Being a mom is a difficult but very rewarding job. My babies are usually tough in the first month or so but then they even out as time goes on. One thing that I was constantly doing was feeding, diapering and burping those babies and washing their tiny clothes. Do you realize just how much laundry you do when you have a new baby in the house? I change sleepers literally 2-3 times a day from diaper blowouts and spit up accidents. My first baby was like a fountain and she would soak everything when she spit up. It was awful. Those types of stains can be hard to get out and I have found through the years that as my children grow older, the stains do NOT stop. In fact, they can be worse. If you are a mom and have some messy little people running around you then you are going to have to try out this next product. The Purex Fels-Naptha Laundry Bar is over 100 years old and is still working for many people today. I remember the first time I saw this laundry bar on a store shelf and I distinctly recall looking at it and thinking "WHAT in the world would I use THAT for???" Well, today I now know what this bar is for. I was thrilled when I found out that I was going to get to review this product and share it with all of you! If a laundry bar like this one has been around for over 100 years - it has got to be a good one! Not to mention I have a huge need for a good stain removing product around my house! 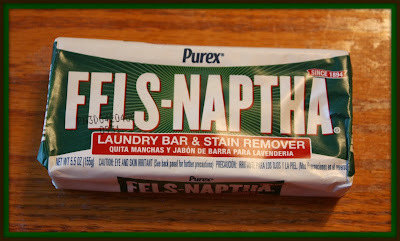 So, for this review I was sent a Fels-Naptha Laundry Bar! When my package arrived and as soon as I opened it I could smell this soap. I love how it smells "old-fashioned" and hearty. Sometimes laundry soap smells too flowery but this definitely smells like an old-time soap. If you are the type of person who likes to make your own homemade laundry soap than you can definitely use this soap for that. Or, you can simply grate it into your washing machine for an extra "boost". For the purpose of this review though, I chose to use it as a stain remover. My in laws brought a pair of jeans over that belonged to my hubby at one point in time and I noticed right away that there was grease, or some sort of staining on the thigh area of the jeans. Sooo, I thought I would put this laundry bar to the ultimate test and try to remove the grease. First, I wet the stained area really good with water. Then, I worked the Laundry Bar over the stains and rubbed in the soap for awhile. After a few minutes of letting the soap settle in, it was into the washing machine with the jeans and the waiting game began! I was really wondering what would come of the stain treatment...would it work? I wasn't sure so I waited until the jeans came out. Well, the sad news is that the stains did NOT come out of the jeans. Now, I do not know what the stain was or even how long it had been there so that doesn't mean that this laundry bar didn't work. I put it to a VERY difficult test and it didn't work but I know that if I am dealing with a fresh stain it will most likely work wonders. 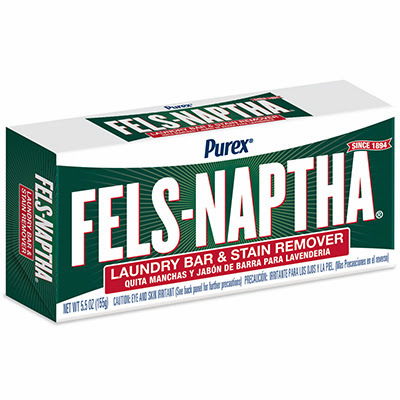 I am totally excited to try out Fels-Naptha on any other tough stains that may come through the laundry and I feel well equipped to handle them efficiently now! You can find the Purex Fels-Naptha Laundry Bar at major retailers across the country. Disclaimer: As a Purex Insider, I received no monetary compensation for this post. 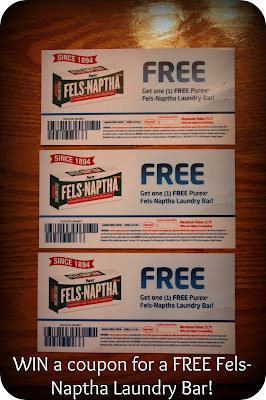 Purex did provide me a free sample of their Fels-Naptha Laundry Bar for review purposes. All quotes and stock photos are from the Purex website and email. Prizes are in coupon form and will be mailed by myself. This blog is not responsible for lost, damaged or stolen prizes and in this case, I am not responsible for replacing coupons under any circumstances. All thoughts and opinions are 100% mine. I use Fels-Naptha ... I love it! 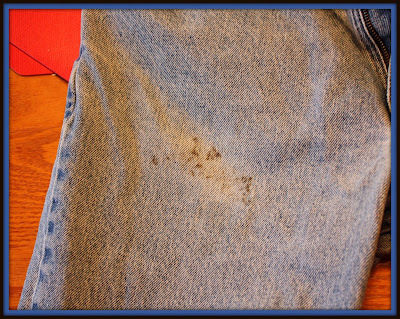 Some stains need a second application but typically it works the first time around. It's brilliant! Right now I am using shout, but I would love to try this. I use Fels Naptha now! I just try to get it out with a brush. I just use my liquid laundry soap on the spot. I've heard of this soap but never tried it! I have been using Shout to treat stains. I actually do not have an actual stain remover that we use. 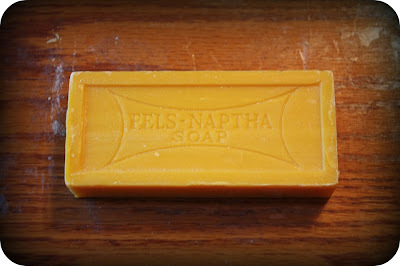 We make our own laundry soap and Fels Naptha is the soap we use. I currently use Shout spray for getting rid of stains. I use the tide pen.